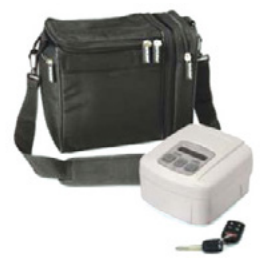 IntelliPAP Standard CPAP Machine BUY DeVilbiss Standard IntelliPAP, DeVilbiss IntelliPAP, IntelliPAP CPAP, DV51D, DV51D-S, DV51DHH, DV51DHH-S, IntelliPAP Machine. IntelliPAP Standard Model - SHIPS FREE! IntelliPAP Standard with Heated Humidification - SHIPS FREE! 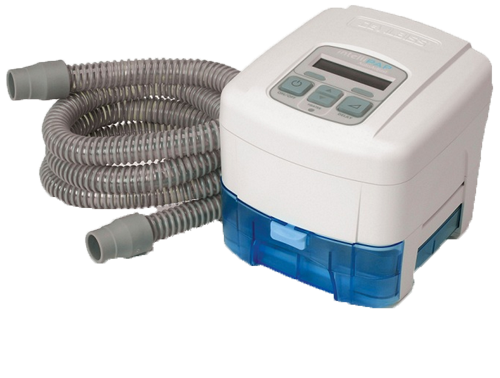 IntelliPAP Standard CPAP Machines is a fixed pressure device ranging from 3 cm H2O to 20 cm H2O. Designed to help people with Sleep Apnea, the IntelliPAP Standard CPAP Machine features SmartCode that offers remote collection of CPAP usage data. Manufactured by DeVilbiss, IntelliPAP Standard CPAP Machines provide Continuous Positive Airway Pressure (CPAP) for Obstructive Sleep Apnea (OSA). By blowing pressurized air down the nose and throat, the IntelliPAP Standard CPAP Machine acts as a splint to keep the airways to the lungs open. The IntelliPAP Standard CPAP Machine connects to a mask with air tubing. The CPAP mask provides pressurized air to the nose or mouth or both, depending upon the needs and preferences of the patient. 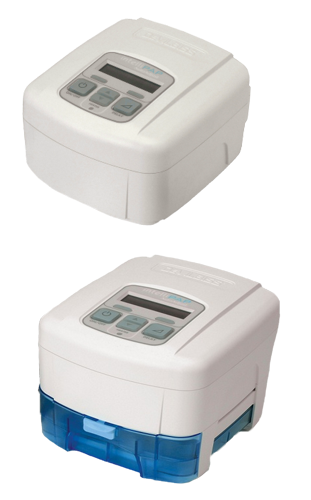 DeVilbiss IntelliPAP Standard CPAP Machines are built with water-resistant housings and reliable electronics to provide years of durable service. The heated humidifier models have a durable Lexan humidifier chamber and a stainless steel heat transfer plate. 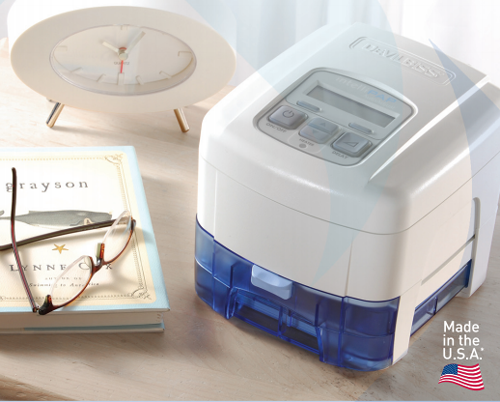 Instead of adding the humidification unit to the side, the IntelliPAP Standard CPAP Machine uses a stacked design that provides a small footprint on your bedside table. IntelliPAP Standard CPAP Model - DV51D. IntelliPAP Standard CPAP with SmartLink Module & Data Card - DV51DS. IntelliPAP Standard CPAP with Heater Humidification - DV51DHH. IntelliPAP Standard CPAP with Heater Humidification, SmartLink Module & Data Card - DV51DHHS. Less than 1% failure rate. SmartCode technology provides remote tracking of compliance data. 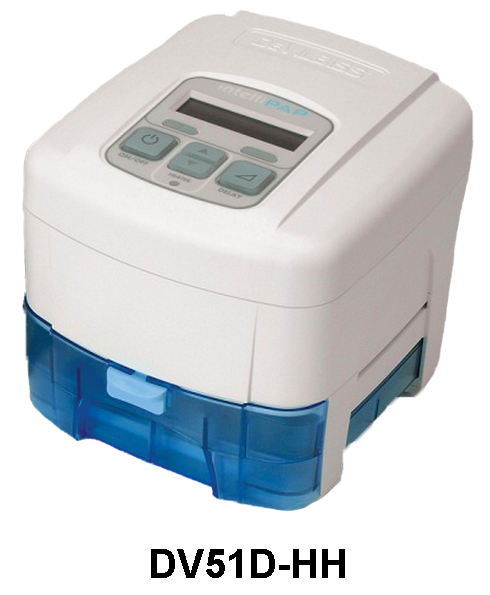 IntelliPAP Standard CPAP Machines Product Numbers: DV51D, DV51D-HH, DV51D-HH-S, DV51D-S. Weight: 4.45 lbs with heated humidification system. Pressure Settings: 3-20 H2O cm. IPAP and EPAP Delta: up to 22 cm. 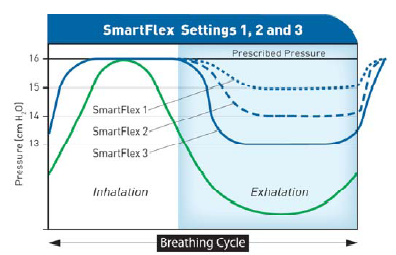 SmartFlex Exhale Pressure Relief: No. Onboard Filter Clean Reminder: Yes. Onboard Compliance Quick Code: SmartCode. Data Transfer via Memory Card: SmartLink. Remote Compliance Data Retrieval: SmartLink. Remote Efficacy Data Retrieval: SmartCode. Delay Pressure: 3 H2O cm to lowest prescribed pressure in 0.5 cm H2O cm increments Delay Time: 0 to 45 minutes in 5-minute increments. Delay Time: 0 to 45 minutes in 5-minutes increments. Auto ON and Auto OFF: Yes. Visual Mask Off Alert: Yes. 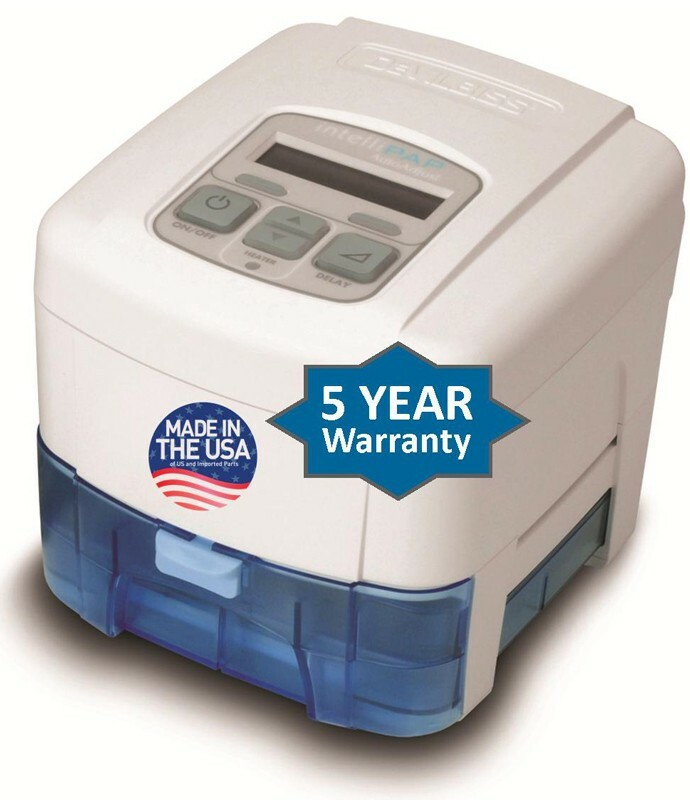 DeVilbiss IntelliPAP CPAP BiLevel S Warranty: 5-year warranty on IntelliPAP, 3-year warranty on heated humidification system, 3-month warranty on humidifier chamber. IntelliPAP Brochure discusses the design features and SmartFlex Technology. IntelliPAP Standard CPAP Flyer provides information about design, performance, humidifier chamber and SmartCode. DeVilbiss IntelliPAP Standard DV51 Instruction Guide is provided in English, Spanish, and French. 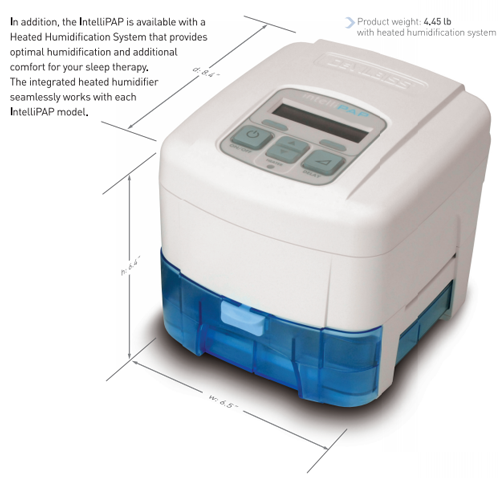 IntelliPAP Standard CPAP Humidifier Use and Care Instructions reviews operating and cleaning instructions. IntelliPAP Overview discusses the quality of these IntelliPAP Series CPAP devices and compact size. IntelliPAP Comparison Chart reviews and compares each IntelliPAP CPAP machine. 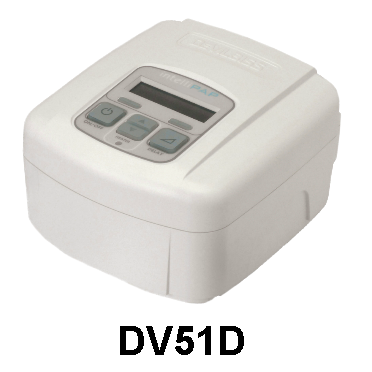 IntelliPAP Standard DV51 Accessories and Replacement Parts lists parts and part numbers for the DV54 Series Machines. IntelliPAP Frequently Asked Questions offers answers to most asked questions. IntelliPAP Standard Warranty provides details of DeVilbiss' warranty information. IntelliPAP Standard CPAP Warranty FAQ answers the most often asked questions about the DeVilbiss warranties.